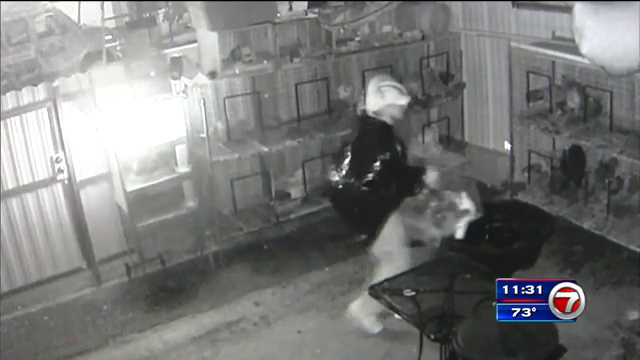 Home » Blogs » Man wearing bucket on his head steals racing pigeons. Man wearing bucket on his head steals racing pigeons. Yup, this is in Florida. Before I go any further, I would just like to say, anytime you see a headline like this, you can pretty much assume it took place in Florida 85% of the time. He probably thought the bucket was a good idea since it would hide every facial feature. That would be great, if you were Neo in The Matrix and can see without eyes. For the rest of us normal folk, visibility would be an obvious issue. As a result, the surveillance video catches a few good glimpses of this”genius” as he tilts the bucket up to see what he is doing in the pigeon coop. He must be working with a very limited disguise budget. He couldn’t find a cheap ski mask or leg stocking instead? That’s burglary basics my friend. Who knew pigeons could be so valuable! Also, I just google searched “pigeon racing” & it’s a real thing. I’m learning so much today. For those who have been eager for pigeon racing tips, you have online resources! Bucket or no bucket, it shouldn’t be difficult for authorities to catch this guy. While I guess some money is involved in quality pigeons, I can’t imagine the underground market for them being big enough where this guy wouldn’t stick out like a sore thumb trying to turn them around for a profit.